The SPX managed to rally back off the lows to only end up down less than 7 points. 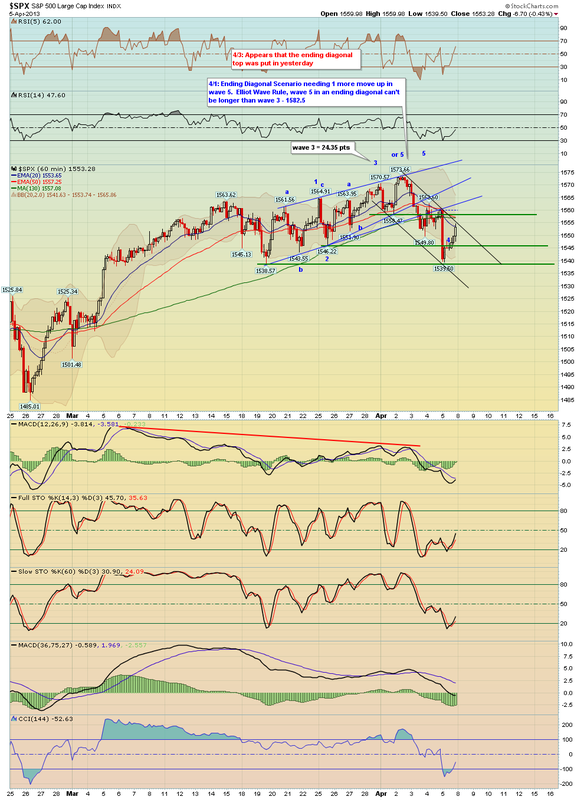 The SPX bounced exactly off or initial target of 1540, which was a good place to take profits on shorts. And if you wanted to take another short at higher prices near the close you are in a much better position than if you had held. Otherwise I drew a channel (see the black lines) for next week I still favor some kind of lower high to be in place and then another pullback - but as we know with this QE driving market, anything is possible. take care and we'll have have two comprehensive newsletters for the weekend! *Click Here* to sign up for our paid service, right now we have a sale on our 6 month membership, which is 50% cheaper than our standard monthly membership! BPT just turned 10 years old!